For 4-H members like Tucker Padgett, 10, a passion for agriculture can really pay off. During the 2017 cattle showing season, she won nearly $5,000 showing her prize-winning heifer at competitions in and around Escambia County, Florida. All those hours training her animal to walk with a halter and follow her commands were the key to her success. This years she’s involved in a whole range of livestock-related activities, as well as leadership and community service projects. Tucker always had a strong interest in animals. She began raising chickens and goats as a hobby. When she attended a livestock show last spring, she set her mind on showing a cow the following year. In order to be able to afford a cow, Tucker sold off part of her goat herd. She also participated in the NW Florida District Chick Chain project. The birds she received during that project started laying eggs and she began to sell them in addition to some of her goats in order to pay for her feed. Tucker bought a heifer from a local breeder, but neither she nor her family had ever raised a beef project. She attended the Beef Showmanship Workshop series and other livestock workshops focusing on confirmation and nutrition in order to learn how to raise her heifer. Over the following months, Tucker halter broke, and began to work with her heifer in preparation for the upcoming show season. In October of 2017, Tucker attended her first cow show. She placed 1st in her showmanship class. Although nervous, Tucker felt prepared as she had spent numerous hours preparing. A few weeks later, Tucker showed at the National Peanut Festival in Dothan, Alabama, where she placed 4th out of 20 youth in her showmanship class. Throughout the 2017 show season Tucker has won $4,860. Wanting to learn even more, Tucker has started attending livestock Judging workshops, joined the 4-H meat judging team, volunteered to show livestock at an Extension farm tour, is active at 4-H county council meetings, and is actively involved in her community club. 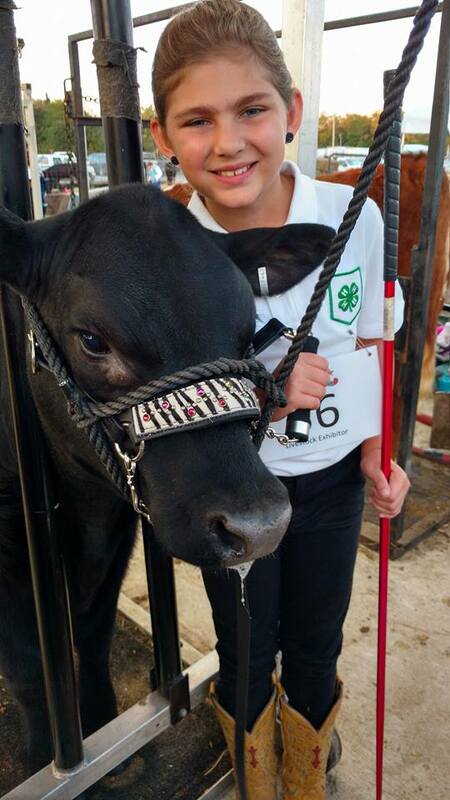 Though she is only 10 years old, Tucker has learned how to be an entrepreneur and excel in her arena.